Among all the states, Uttar Pradesh has the most number of pilgrim centres and religious cities. Hence, pilgrim tourists frequent venerated places like Varanasi, Mathura and Vrindavan for darshan of their favourite deities and attain salvation after death as per Hindu belief. Also known as the Golden temple, this is the presiding temple of Benares. It is dedicated to one of the twelve Jyotirlingas of India. The temple was destroyed and rebuilt many times. The present structure was constructed by Rani Ahalyabai Holkar in the 18th century. Legend says that the jyotirlinga manifested on a dispute between the holy trinity of Gods -- Brahma, Vishnu and Shiva, as to who was the supreme god. Shiva converted himself into a column of light, the jyotirlinga. Neither Brahma nor Vishnu was able to discover the ends of the linga. They then conceded defeat and worshipped him. The temple is near Kashi Vishwanath temple at Varanasi. It is a major temple devoted to Goddess Shakti, widely known here as Annapurna, carrying a cooking pot rather than the fearsome weapons being carried by her other forms such as Kali and Durga. She is the divine consort of Kashi Vishwanath (Shiva) and is considered to be the 'Mother of the Three Worlds'. Within the temple complex lies a subsidiary temple housing a solid gold image of Annapurna, which opens only three days a year. Adjacent to this shrine is a grand idol of Lord Shani or Saturn, in silver against a black background. A Ram Mandir is also present at one corner of the complex. A food festival is organised here in October or November. During Diwali, the golden image of Annapurna is shown as giving alms to Shiva for the welfare of the world. This is a beautiful marble temple located close to Assi Ghat, the merging point of therivers Ganges and the Assi. The temple has an old Shivling that draws a large number of devotees. This huge Shivling is positioned under a peepal tree. During the ritual journey called ‘Panchatirthi Yatra', devotees usually take bath in the Assi Ghat prior to entering the temple. According to myth, the holy ghat was formed by the sword of Goddess Durga who defeated demons Shumbha and Nishumbha. Located in Varanasi, the temple is dedicated to Mother India. The temple was built by Babu Shiv Prasad Gupt in the Mahatma Gandhi Kashi Vidyapeeth. Mahatma Gandhi inaugurated the temple in 1936 and a marble statue of Mother India draws huge crowds on festive occasions. The statue is a model of undivided India in three dimensions with the mountains, plains and oceans in right proportion. 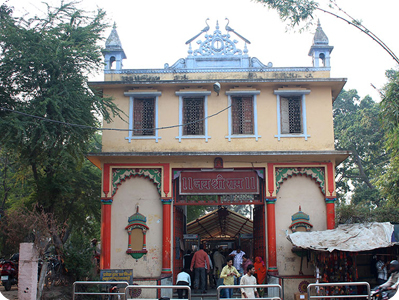 Chausatthi Devi temple is located in Varanasi. 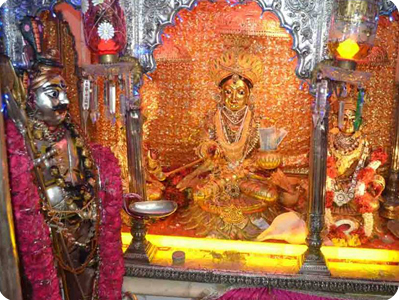 The presiding deity here is Chausatthi Devi, who is considered as the mother goddess. The name ‘Chausatthi’ is derived from word ‘chausatha’, which means 64. It indicates the number of yognis (assistant goddesses) of the mother goddess. However, the temple only enshrines 60 of these deities. The remaining 4 have been moved to other locations. The temple attracts a sizeable number of devotees during the new moon day of the Hindu month of chaitra (March-April). On this auspicious day the pilgrims pay their homage to the goddess and take a dip in the holy waters of Ganges River, which flows nearby. Chausatthi Ghat is located nearby. This is a sacred shrine on Mira Ghat, one of the ghats in Varanasi. The temple is dedicated to Lord Yama, the god of death and justice. In the vicinity of this temple lies a well named 'Dharma Kupa' meaning the "Well of Justice". There are five other temples nearby. Among these five temples, the oldest is the temple of Vriddhaditya, literally meaning "Old Sun". The shrine is dedicated to Surya, the Sun God, who is considered the father of Yama. It is one of the oldest temples in Varanasi situated on Vishwanath Lane, within a walking distance from the Kashi Vishwanath temple. This temple is devoted to Lord Ganesh, the preserver of knowledge and wisdom, and the remover of obstacles. An ancient temple in Varanasi near the intersection of Chauli Road and Kabir Chaura Road. This highly sacred shrine is devoted to Kala Bhairava, a terrifying mood of Lord Shiva, who cut off the fifth head of Lord Brahma. He is also considered by the devotees as the religious magistrate of the city. This is the only temple which miraculously escaped the wrath of Mughal emperor Aurangzeb. This is a highly revered shrine in Varanasi. Lord Shiva in the form of Mrityunjaya is the presiding deity here. It is believed that by worshipping Shiva one can win over his death. A large number of devotees come here for performing Mahamritunjay-path - a ritual to dispel all kinds of fears and diseases. Also known as Kathwala temple, the holy shrine is situated in Varanasi. 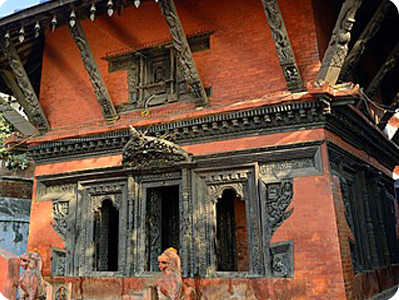 It was built by the King of Nepal on Lalita Ghat in Nepali style. The temple features exquisite woodwork. The wood used in the temple is also found in Nepal. The specialty of the wood used in the temple is that termites do not eat this wood. The workers who carved this temple were brought from Nepal. The temple is located adjoining the Mira Ghat. The presiding deity is Lord Shiva. This temple is a relatively new one built in 1956. It was constructed by a Brahmin named Swami Karapatriji. Owing to his orthodox views, he believed that the famous Kashi Vishwanatha temple had become impure due to the entry of the lower caste people. He therefore built the new temple. A major ritual held at this temple is the offerings given to the ancestors. Water is poured on the steps and some hymns are chanted to propitiate the souls of the deceased persons. Located on the Durga Kund Road, the temple is one of the ancient shrines in Varanasi. 'Sankat Mochan' literally means "deliverer from troubles". This temple is believed to have been built by Tulsidas, a saint poet. The presiding deity is Lord Hanuman. The Sankat Mochan Music Festival, celebrated here to mark the birth of Lord Hanuman, draws people from far and near. Artists from all over the country assemble here on this occasion. The birthplace of Lord Rama is situated on the right bank of the river Saryu and this holy town is just 6 km from Faizabad. This town is closely associated with Lord Rama, the seventh incarnation of Lord Vishnu. 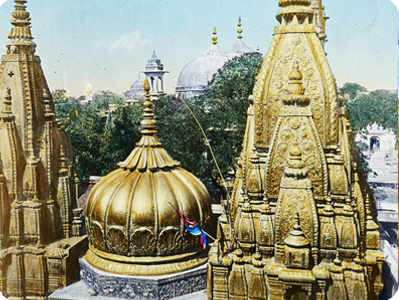 The ancient city of Ayodhya, according to the Ramayana, was founded by Manu, the law-giver of the Hindu. For centuries, it was the capital of the descendants of the Surya dynasty of which Lord Rama was the most celebrated king. 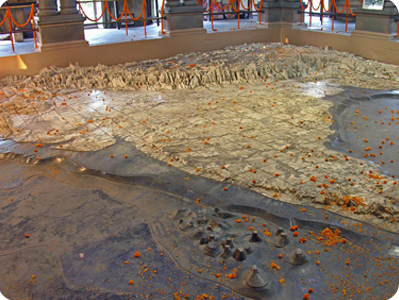 Ayodhya during ancient times was known as Kaushaldesa. Ramkot, the chief place of worship in Ayodhya, is the site of the ancient citadel of Ramkot which stands on an elevated ground in the western part of the city. Although visited by pilgrims throughout the year, this sacred place attracts devotees from all over India and abroad on Ram Navami. Ram Navami is the day of Lord’s birth which is celebrated with great pomp and show in the Hindu month of Chaitra (March-April). It is a former Buddhist vihara (cave with cells) that became a Hindu temple later on. It is dotted with little shrines and if you stand on the topmost terrace you get a splendid view of Ayodhya, one that includes a cluster of small white buildings at the base of the hill that turns out to be a Muslim graveyard. It is a temple that stands at the place where Rama is said to have performed the Ashwamedha Yagna. The Raja of Kulu is said to have built a new temple here about 300 years ago called Kaleram ka Mandir, where the idols of Lord Rama, Sita, Lakshman and Bharat have reportedly been carved out of a single block of black sandstone. These idols are supposed to be from the original Rama temple, which once stood on the banks of the River Sarayu. The temple is situated near Hanuman Garhi. The Bhawan is frequented by scores of visitors every year. The temple is widely known for the idols of Sri Rama and Sita wearing gold crowns and because of this the Bhawan is also referred to as Sone-ka-Ghar. It is one of the best temple in Ayodhya build in 2008. In this temple Lord Ram is presented in 12 faces called "Viswa-virat" (world's big). This temple is made by the red marbles and stainless steel. "Choti chawni" is a big temple made by pure, white marble. Sita Ki Rasoi is a beautiful shrine situated to the north-western corner of the Rama Janmabhoomi in Ayodhya. It is the place where Sita cooked the meal for her family, the first time, after her marriage with Lord Ram. The main attraction is the symbolic kitchen utensils seen there. The temple houses the idols of four brothers Ram, Lakshman, Bharat and Shatrughna along with their wives Sita, Urmila, Mandavi and Srutakirti. 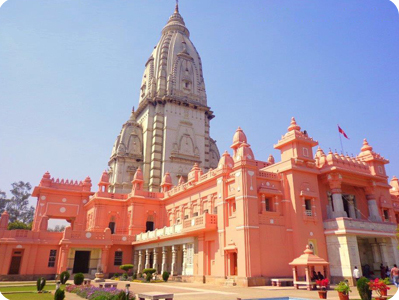 An outstanding marble temple, Birla temple is located in Ayodhya. It enshrines the images of Lord Ram, Sita and Lakshman. Positioned centrally in the holy city of Ayodhya, Hanumangari temple is one of the highly revered shrines in Faizabad district. It is believed that Lord Hanuman guarded the Ramkot or Janmabhoomi by living here in a cave. Main attraction is the idol of child Hanuman seated on the lap of Anjani. Devotees need to climb 76 steps to access the temple. This beautiful temple is in the shape of a four-sided fort. Bastions of circular shape are seen at each corner of the temple. Devotees believe that one can fulfil all their wishes by praying at this holy shrine. 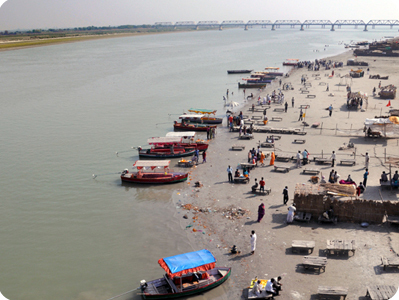 It is located on the banks of the Yamuna at Sikandra. This is a temple dedicated to Lord Shiva. The Kailash fair is held here in honour of Lord Shiva, celebrated to commemorate his appearance as a Shiva Linga in the monsoon months of August and September. The temple is located on the banks of Yamuna river in Baleshwar town. It is dedicated to Lord Shiva. It is one among the four temples in Agra dedicated to Lord Shiva (located at the four corners of Agra). The temple is built on a huge expanse of land. It is one among the four temples dedicated to Lord Shiva. It is located very near to the railway station. The temple is surrounded by a market place dating back to the Mughal era. This was the heart of the Mughal Agra. The locals believe it is auspicious to visit the temple in the evening especially during the monsoon. The temple is located at Dayal Bagh, a sacred place in Agra. This beautiful temple is believed to have been built in 1861. It is a magnificent structure, 110 feet high, built of pure white marble. It houses the samadhi of Swamiji Maharaj, the founder of Radha Swami faith. Dayal Bagh temple has been under construction for the last 100 years. Some people consider this building as an alternative to the great Taj Mahal. This headquarters of the Radhaswami sect is located at Dayalbagh in Agra. The temple is noted for the marble carvings and inlay work that is claimed to be superior to those at the Taj Mahal. It is one of the important tourist attractions in Agra. One can see artistes carving at the site. This popular temple is located in the heart of Lucknow. The presiding deity here is Lord Hanuman. With a height of 6.5 feet, the one-piece marble idol is visible from all corners of the puja hall. The temple is also noted for its grand architecture, a perfect blend of old and new trends. Located in Lucknow, the temple is dedicated to Lord Hanuman and was built by the Nawabs, the Muslim rulers of Lucknow, in medieval times. People of both Hindu and Muslim faiths offer worship in this temple. The temple, though small in size, attracts a large number of devotees. Located near Jhansi, Kargaun Jain temple is an underground temple dedicated to BhagwanParshwanath. Kargaun is situated at a distance of 5 km from Jhansi. Boarding and lodging facilities are available in Jhansi. Kargaun is well connected by rail and road to major cities from Jhansi. It is a beautiful shrine situated in Jhansi. The temple is located near the entrance of the Jhansi Fort. The temple enshrines Lord Ganesh as the presiding deity. Ganesh Mandir is also famous as the marriage ceremony of Rani Lakshmi Bai and Maharaja Gangadhar Rao was held here. This is a highly revered shrine situated at Jhansi. The temple enshrines Goddess Lakshmi as the presiding deity. This imposing temple was built in 18th century. The temple is situated outside Laxmi ‘Darwaza’ near Laxmi Tal. A popular temple known as JK temple, this is a wonderful piece of architecture and art in Kanpur.The temple has statues of Lords Krishna, Shiva, Hanuman, Vishnu and Rama. The temple is located in the heart of the city near Gumti no. 5 and Pandav Nagar. The illuminated towers of the temple can be seen from quite a distance at night. The temple is situated adjacent to Kamla Tower in Kanpur and dedicated to Lord Krishna. The temple is famous for the Jhoola or swing festival held in Shravan (July-August), a month in the North Indian Hindu calendar.During the festive days of Holi, Janmashthami and Diwali, the temple is decorated on a grandiose scale. The best-known temple in Vrindavan and home to a Krishna idol known as Thakur-ji. The idol's eyes are said to be so powerful that it is kept hidden from view behind a curtain, which is opened and closed every few minutes. Built by Man Singh of Jaipur in 1590, this squat, bulky temple in Vrindavan reportedly had four stories lopped off during Aurangzeb's reign of terror. These days it is just infested by monkeys for want of proper upkeep. Also named 'Naam Yog Sadhna Mandir', the temple in Vrindavan resembles the Taj Mahal built with white marble. It is a unique temple in that you are prohibited from donating if you are a non-vegetarian. This is better known as the ISKCON temple. A major draw for Hare Krishna (ISKCON) pilgrims to India and among Vrindavan's temples, this shrine is well equipped to deal with foreign visitors. This is the single largest temple in Vrindavan, built in 1851 in a South Indian style, complete with intricate seven-storey gopuram (gateway) at the entrance. Inside is a 50-ft high wooden chariot, taken out yearly for festivals, and in the inner courtyard is the 50-feet high gold-plated pillar known as Dhwaja Stambha. It is a very well-known ancient temple of Vrindavan founded by Hith Harivansh Mahaprabhu. Sri Radhavallabh Lal's idol resembles Sri Radha and Sri Krishna to be embodied in it together as "One soul and two bodies".